NASA's prolific planet-hunting spacecraft has hit the jackpot again, discovering 11 new planetary systems with 26 confirmed alien planets among them. The findings nearly double the number of bonafide planets found outside our solar system by the Kepler space observatory. The newly detected worlds vary in size from 1.5 times the radius of Earth to larger than Jupiter; 15 of the 26 planets fall between Earth and Neptune in size. While all of the planets tightly orbit their parent stars, more research will be required to determine which worlds are rocky like Earth, and which have thick, gaseous atmospheres like Neptune, the scientists said. By studying these different planetary systems, scientists can glean valuable information about how planets form. The Kepler spacecraft, which orbits the sun, stares at a patch of sky that contains 150,000 stars and locates potential alien planets by measuring the tiny change in brightness that occurs when a planet transits — that is, passes in front of — a star. Once a planetary candidate is identified, further observations are conducted by ground-based observatories to weed out the false positives. "Confirming that the small decrease in the star's brightness is due to a planet requires additional observations and time-consuming analysis," Eric Ford, associate professor of astronomy at the University of Florida, explained in a statement. Ford is the lead author of a study that confirms two of the new systems, Kepler-23 and Kepler-24. "We verified these planets using new techniques that dramatically accelerated their discovery," Ford said. Each of the newly found planetary systems holds two to five closely spaced transiting planets, the researchers said. Since these systems are tightly packed, the planets exert gravitational forces on one another, speeding up or slowing down their orbits. The orbital period of each planet is altered in the process. "By precisely timing when each planet transits its star, Kepler detected the gravitational tug of the planets on each other, clinching the case for 10 of the newly announced planetary systems," Dan Fabrycky, of the University of California, Santa Cruz, said in a statement. Fabrycky is the lead author of the paper that confirms the Kepler-29, -30, -31 and -32 systems. Five of the systems (Kepler-25, -27, -30, -31 and -33) contain a pair of planets, the inner one circling its star twice in the time it takes the outer planet to make one lap. Four of the systems (Kepler-23, -24, -28 and -32) are home to a pair of planets where the outer one orbits the star twice for every three times the inner planet circles the parent star. "These configurations help to amplify the gravitational interactions between the planets, similar to how my sons kick their legs on a swing at the right time to go higher," Jason Steffen, a postdoctoral fellow at Fermilab Center for Particle Astrophysics in Batavia, Ill., said in a statement. Steffen is the lead author of a paper confirming the Kepler-25, -26, -27 and -28 systems. The system with the most planets is Kepler-33. The star, which is older and more massive than the sun, hosts five planets that range in size from 1.5 to five times that of Earth. 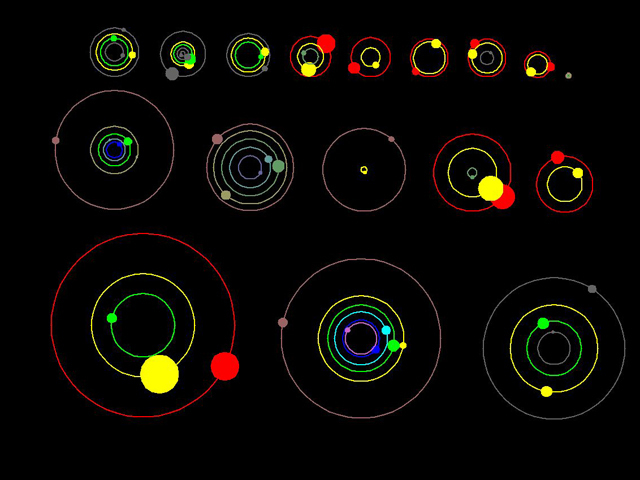 All of these planets orbit closer to their star than any planet circles our sun. Once the properties of a star are understood, such as the telltale light signature of a planet crossing in front, it becomes easier to eliminate false positives, the researchers said. The newly discovered planets increase the Kepler mission's tally of confirmed planets to 61, with 2,326 other planetary candidates. The four separate papers appear in the Astrophysical Journal and the Monthly Notices of the Royal Astronomical Society.